For those of you who could not stretch to buying the hardback, or who now want to shower your friends with copies of Artemis Cooper’s fine biography, the time is almost upon us when you can purchase the paperback, just in time for summer holiday reading. It is apparently due for release on 27 June 2013, but as ever is available for pre-order. 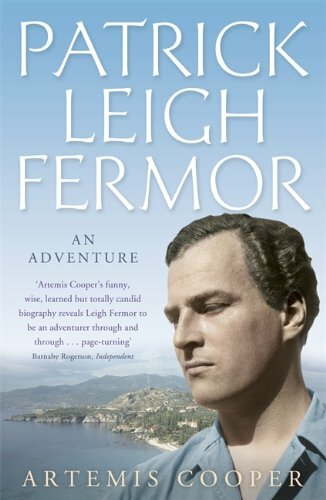 You can order the paperback version of Patrick Leigh Fermor: An Adventure here. As you can see it has a distinctly different cover with the famous view of the house at Kardamyli, whilst still showing our hero at the peak of his powers. This entry was posted in An Adventure: Paddy's Biography by Artemis Cooper and tagged An Adventure, Artemis Cooper, Patrick Leigh Fermor on June 4, 2013 by proverbs6to10. I do hope the publisher of the paperback will correct the omission of Lyndall Hopkinson’s name from the index.Her relationship with PLF is filled with implicit psychological insights about our hero. Hmmm, yes. There is something oddly familiar about the view on that book cover . . .